Picturing Disney: Etsy Shop Review & Giveaway!! In the spirit of Disney Adventures I have another great giveaway from Chunkee Monkee Bowtique! 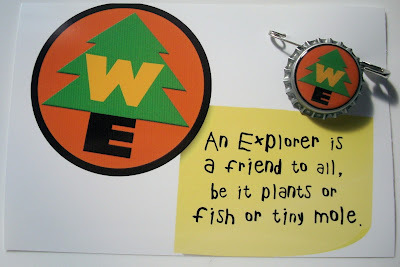 Last year when I got an amazing Disney/Pixar "Up" inspired bottlecap pin I emailed the amazing shop owner through Etsy and let her know about my blog and how much I adore my new adventurer pin! She was gracious enough to give away both a Grape Soda bottlecap pin (through a fun Facebook trivia contest) and then later on her Wilderness Explorer Badge pin. As you can probably guess, Terri is a great shop owner and her pieces are of the highest quality. I have been wearing my Grape Soda pin on my winter fur-lined bubble vest for over a year and it has taken heat, cold, and a few times of me slamming my jacket around and still it looks like it is in brand new form. The epoxy she uses to seal and the way she runs the pin through the bottlecap is far superior to others I have seen on Etsy. Plus, her shop is chock full of other fun items! There are bottle caps, bottle cap sheets, hair ties, bows, headbands, and she takes custom orders as well! I can not recommend this shop any more for any of your accessory needs! The customer service is unbeatable and the prices are more than fair! After talking to Terri last week she has now graciously offered to donate more pins for a giveaway here on Picturing Disney! You can use the rafflecopter form below to enter for your chance to win BOTH a Wilderness Explorer Badge pin and a Grape Soda pin! These are amazing quaility and will be sent to you directly from Chunkee Monkee! There are lots of ways to enter- you can nab a few entries for a bunch of things you probably do already! And as an extra thank you to those who have so generously and graciously donated to our Feeding America fundraiser you get TEN extra entries if you donate (remember $1 can provide 8 meals to those in need)! I can not thank you enough for helping our cause and for following and reading Picturing Disney! I hope this fun giveaway reminds me how much you all mean to me! Thanks again to Terri and Chunkee Monkee Bowtique! Remember to complete all required information fields for entries or your entry will NOT be counted! Belle and Beast or Jasmine and Aladdin! Mickey and Minnie, and LOVE Carl and Ellie too!!! Mickey and Minnie of course, but Carl and Ellie run a very close second! I would say Mickey and Minnie are first of course! Than Carl and Ellie are on their six!! !